Meigs freshman Baylee Tracy (1) defends an attack in front of classmate Hannah Durst (11), during the Lady Marauders’ loss to Athens on Tuesday in Rocksprings, Ohio. ROCKSPRINGS, Ohio — If nothing else, as the night progressed, so did the Lady Marauders. 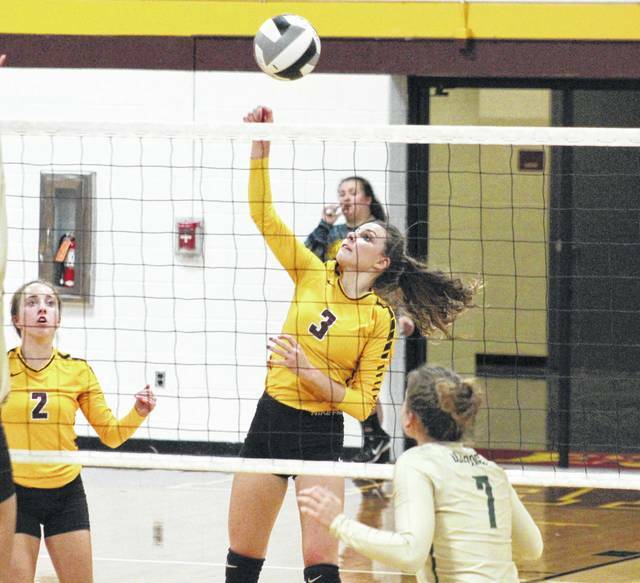 The Meigs Volleyball dropped a straight game decision to Tri-Valley Conference Ohio Division leading Athens on Tuesday evening in Larry R. Morrison Gymnasium, with the Lady Bulldogs’ margin of victory shrinking in every game. Meigs (6-8, 3-3 TVC Ohio) stumbled out of the gates, as Athens (11-5, 6-0) never trailed en route to a 25-4 victory in the first game. The Lady Marauders led initially in the second game, but the Lady Bulldogs took the advantage at 4-3 and never trailed again. Athens led by as much as 13 in Game 2, winning by a 25-14 count to move ahead 2-0 in the match. Meigs led by as many as three points in the early part of the third game, but AHS took the lead at 7-6. The Maroon and Gold regained the lead at 8-7, but Athens took the advantage back at 9-8. The Lady Marauders went ahead 11-9, but surrendered eight straight points and never regained the lead, falling by a 25-18 final. 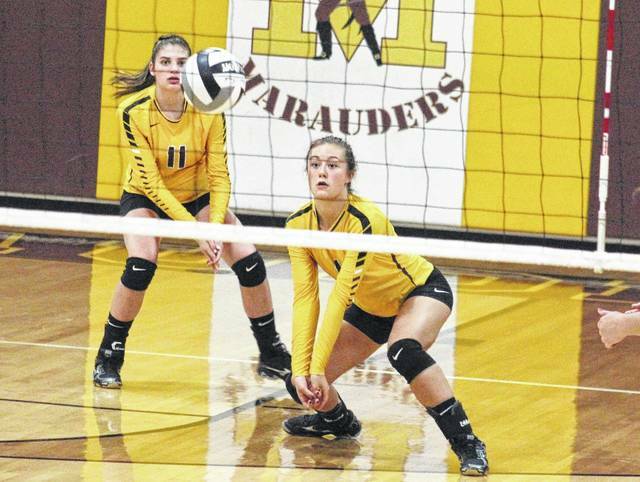 With a service percentage over 90 in each of the three games, the Lady Marauder service attack was led by Kassidy Betzing and Marissa Noble with three points apiece. Paige Denney and Maddie Fields each had two points, with an ace by Denney. Maci Hood and McKenzie Ohlinger had one service point apiece in the setback. 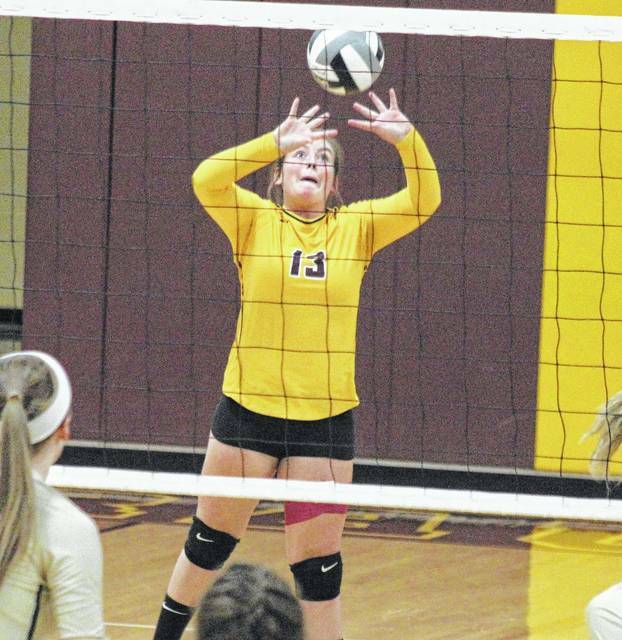 Betzing also led the Lady Marauders at the net with five kills and two blocks. Hood had two kills and one block, Denney added one kill and two blocks, while Noble contributed one block. Baylee Tracy and Saelym Larsen each had one kill for the hosts, while Fields dished out a team-high eight assists. 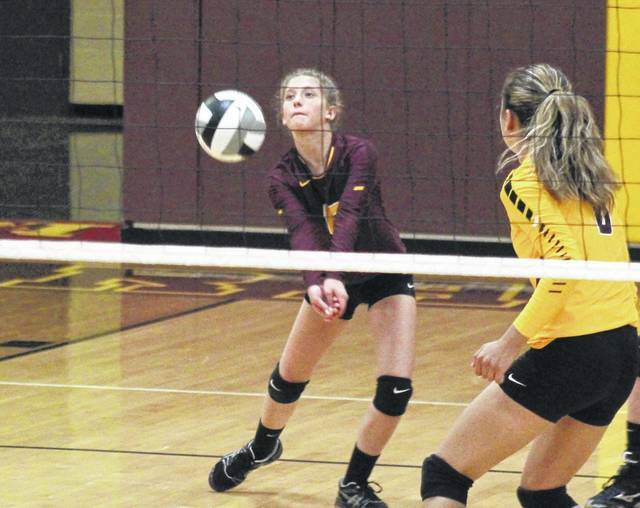 The Lady Marauder defense came up with 21 digs in the match, led by Betzing with five. The Lady Bulldogs were led by Ava Meyers with 14 points and Serena Smith with 12 points, including a pair of aces. Baelyn Carey had nine points in the win, Sierra Smith added seven points, while Ashton Stover had four, Nicole Sammons marked three and Gabby Carey scored one. At the net, Gabby Carey led Athens with 15 kills. Rachel Gwinn posted nine kills, while Sierra Smith had seven kills and 29 assists. Serena Smith, the AHS libero, led the guests on defense with 12 digs. Meigs and Athens are scheduled to clash again in the Lady Marauders’ season finale on Oct. 12 in The Plains. The Maroon and Gold will be back on the court at home on Thursday against Alexander.